A few weeks ago I was lucky enough to be presented a possibility to compose my own personal finance seminar by one of Estonia’s local training companies. The whole coaching program needs to be 7 hours long and to date I have only put together a fraction but I already feel that there are some things that I have learned from the opportunity! Some of you might be familiar with the concept that every person actually has 3 different “self-images”. There is a way that you see yourself, a second way how other people see you and a third way that represents who you actually are. In order to have a genuine impression on others, it is important to try and make the gap between how others perceive you and how you see yourself minimal. If the gap is too large people won’t simply believe what you say. When you talk to an audience about how to get rich but your appearance is that of a homeless man, then it doesn’t really matter anymore if what you say is true – people will not believe you because how you seem to them and what you are talking about contradict each other. The same thing can happen in a number of ways. For example when you talk about manners but you are constantly cursing – what you are trying to get across and who you are will contradict each other resulting in the fact that no one will take you seriously. You need to take care that how you say something is consistent with what you say. A few days ago when I tried presenting the first part of the personal finance coaching program that I am trying to put together I got some feedback that I was rather surprised to get. I thought that I had only briefly talked about the way I tried to save money by buying cheap food when I got started in personal finance but it later turned out that my test audience had the impression that one of my main points was that in order to get rich you have to be so frugal that you will be unable to enjoy your life. In fact – if you remember one of my previous posts I believe exactly the opposite – Some things are too good to give up. It’s a good bet that everyone knows a teacher or a lecturer who was extremely boring to listen. Chances are that it was because the lecturer was sitting or standing still and talking in a monotonous voice. 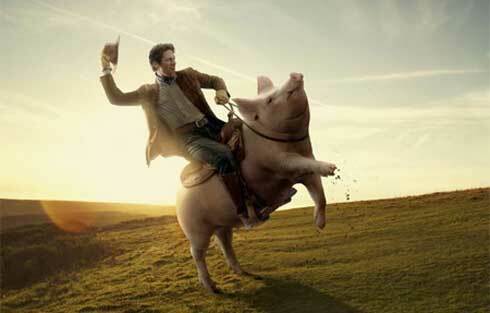 Doing that will only get 7% of your message across to your audience. When you start using your body as well – you are already communicating 62% of your message. To see an example how excellent body language can help you get what you want - see my post about former US president Lyndon Johnson. The first few times I practiced presenting the seminar with my friend Jaak, I appeared very unconfident to him. The reason? While I knew what I was talking about I didn’t know the exact sentences and the order in which to say them. This resulted in too long pauses between my thoughts and me jumping back and forth on different subjects. After rehearsing a couple of times I already knew pretty much what to say when and that made me feel more confident. Your audience will sense whether you’re confident in your topic and if you are not you will lose all credibility! The best way to get confident? Practice. 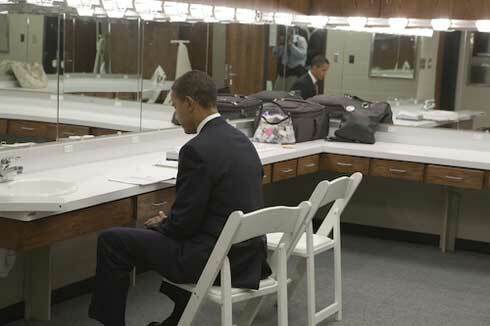 As you see below – even president Obama likes to take a moment to prepare for his speeches! For me it is quite easy to write an article or two about something here on Financial Jesus. A typical post is about 1 certain thing and therefore there are no problems on defining where it starts or where it ends. When putting together a consistent coaching program you need to think about the order of subtopics you will talk about. It is important to start from the basics and move up to the ones that are more complex. After all – you need to read before you can write your own novels. For more updates about how I’m doing with preparing my own personal finance coaching program – sign up to my full feed RSS or subscribe via email. Talking to audiences involve personal selling. You need to present yourself as a valuable individual who can make a real contribution. Someone who can lead you in the right direction. Great post, thank you. To appear confident to others, you need to feel confident yourself. You need to believe that you are doing good, and feel confident about yourself. And then people will believe in you. People will believe in you as long as you believe what you are talking about. self presentation is must than any other skills in this world.